Windows 10 Fall Creators Update continues to surprise with its rapid adoption rate. 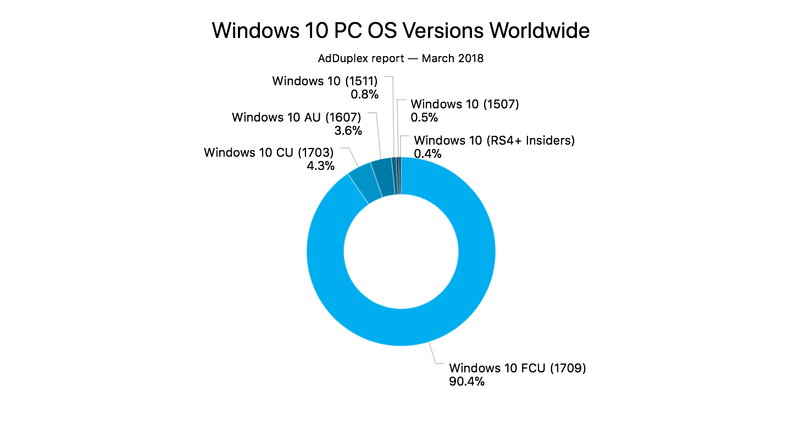 Windows 10 FCU has now managed to be installed on over 90 percent of all Windows 10 PCs. Latest stats from AdDuplex, the largest cross-promotion network for Windows apps, reveal that Windows 10 version 1709 is seeing an unprecedented adoption rate. “According to our numbers, the Fall Creators Update is on more than 90 percent of PCs now,” AdDuplex said in its latest report. Fall Creators Update is undeniably the fastest spreading update in a long time. Windows 10 FCU has experienced this impressive deployment rate since the first week it was released in. From hitting 5 percent in the first week to 20 percent in one month, Windows 10 FCU hit 50 percent of all Windows 10 PCs within just two months after its release. In January, the statistics suggested that the latest version was installed on almost 75 percent of all Windows 10 devices. In comparison, Windows 10 Creators Update hadn’t even hit 75 percent when FCU was released. With Windows maker having finalized Windows 10 Spring Creators Update only last night, the FCU has hit a historic 90.4 percent ahead of the upcoming launch. Windows 10 FCU is potentially the fastest-adopted Windows update of all time. While Microsoft looks ahead at the imminent release of Windows 10 Spring Creators Update, it appears that the company has finally managed to break the code and the most used desktop operating system is no longer affected by fragmentation. Let’s hope the company soon manages to get rid of those compatibility issues that plague every newly released Windows 10 version.